The Kids in the Hall have this nasty habit of always being here for me. First, as a high school kid thirsty for comedy, then as a bonding experience with my girlfriends and college friends, then as a source of solace during a recent rough patch. What sticks out, of course, is just now funny and relevant the show has stayed for more than 2 decades. And that shouldn’t surprise me, because the KITH were a punk rock response to mainstream comedy. That theme song has been imbedded in my DNA to the point that I occasionally hum the bass line to myself. Always being thirsty for new material, this biography by Paul Meyers is just the thing a fan like me would want until the kids return. Having access to all the heavy players in the KITH’s career, it’s no wonder this book offered a big insider’s look. But what also stands out is just how much fun this book is. KITH: One Dumb Guy is the perfect read on a rainy Sunday night with your cat on your lap. And that’s exactly what I did. Having watched featurettes on the KITH in the past, I was always under the impression that McKinney was sort of the “leader” of the group, but not so. Meyers’ book places McCulloch as the head honcho of the KITH, both in forming them, and keeping them going all these years. There are so many interesting accounts here, both their struggle to keep control of their art and finding success on their own terms. It seems like the troupe was constantly striving to dominate whatever scene they were in and trying to move on to the next step as quickly as possible. The formula was Monty Python’s: make a TV show then do a bunch of movies. The kids were a perfect example of how they were greater than the sum of their parts: McKinney’s comedy was completely character driven, Thompson brought an edge to the group as an openly gay member, Foley had the charm (and cheekbones), and McDonald had an incredible eye for detail. That, and of course, they were all really funny and held each other to high standards. 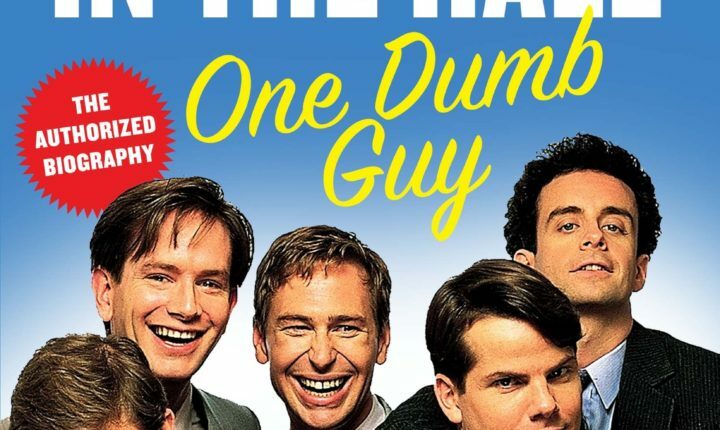 Meyers got input from everyone who played a mayor roll in the career of the KITH, from early troupe members, writers, to Paul Bellini, Lorne Michaels, The Shadowy Men, to people who were greatly influenced by their comedy like Paul Feig and Bob Odenkirk. This book is in-depth and engrossing. My only gripe, as a fan, was that it wasn’t longer. I could easily have read another 100 pages behind the process of making the seasons of the TV show, the Brain Candy movie, and Death Comes to Town. But that’s just a testament to how much I miss this show. KITH: One Dumb Guy is a great supplement for curious about the process of how the KITH make comedy and just how they got to where they were. They might not have been a smash hit, but they’re a cult hit. And that’s so much cooler.